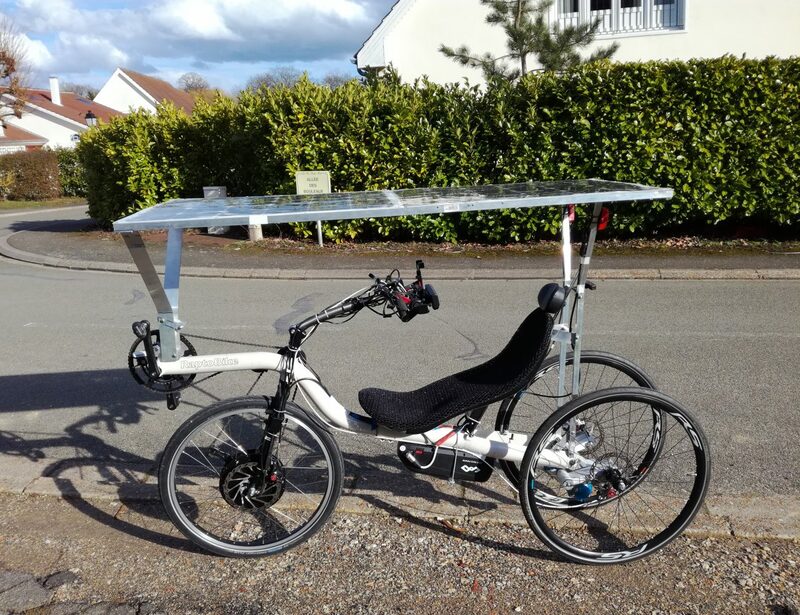 Once these evolutions have been put in place, the Tilting Trike V6 will become the Solar Tilting Trike V1 (STT V1). 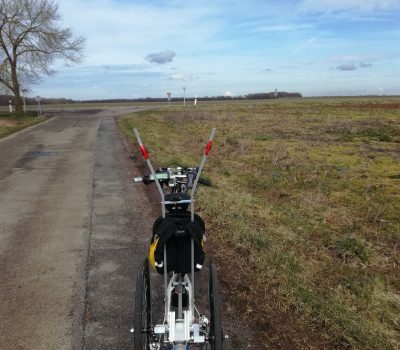 After having evaluated my experiences during the Sun Trip 2017, it was clear: the choice for the new motor was for a DIRECT DRIVE unit. Once the motor was delivered, I put it on the scale: 7.2 kg. In the package all the options I ordered were there, but the CABLE to connect to the battery was not there! So I lost almost a month before the cable was received (from the US), and this was just for the supplier’s fault. 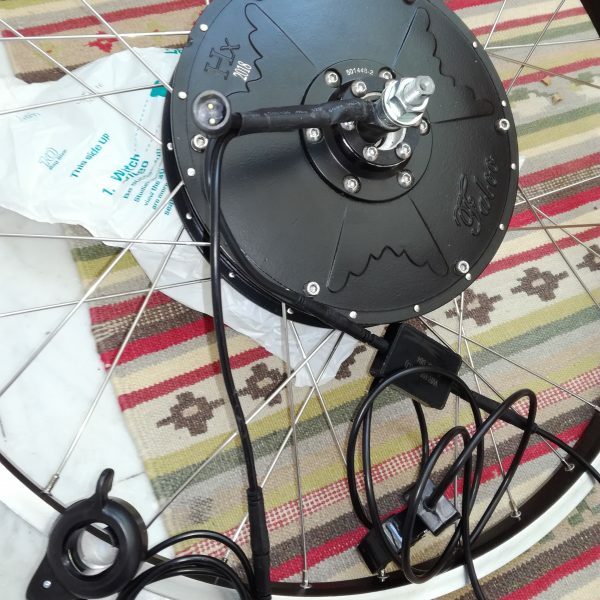 This is the end result: the installation of the hub motor was quite strightforward. I just had to take 1mm off the support for the brake caliper because the disc was almost rubbing on it. 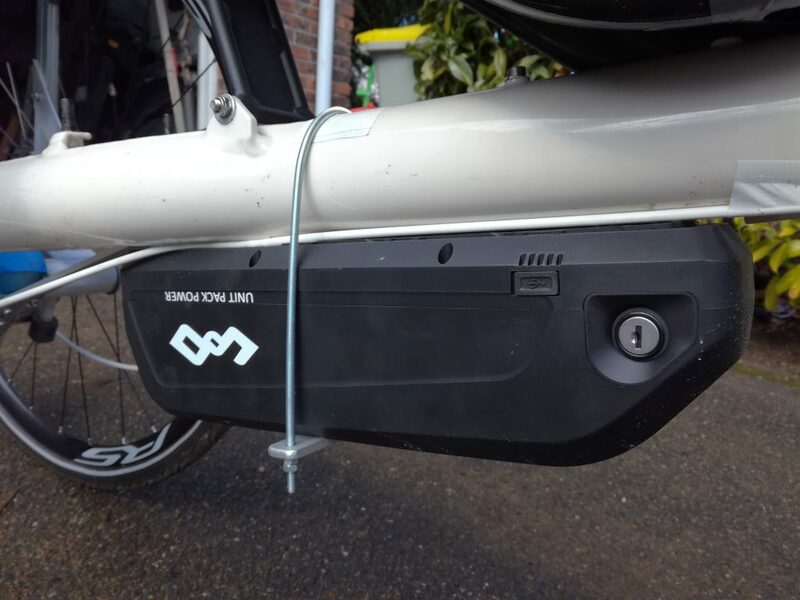 The battery is a Lithium one, 48V and 16Ah: total capacity around 800Wh. 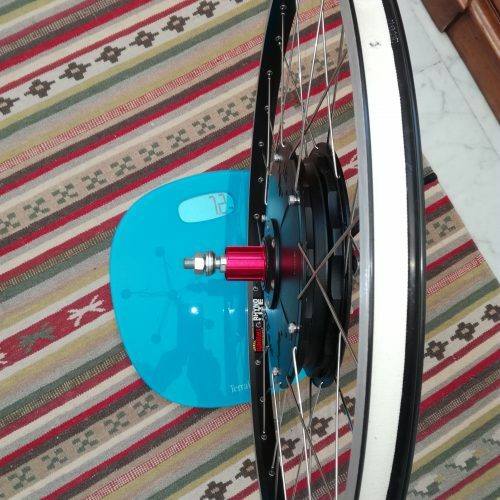 The position to be installed on the bike is below the frame in a place which is very low and it is not taking out space to other accessories. 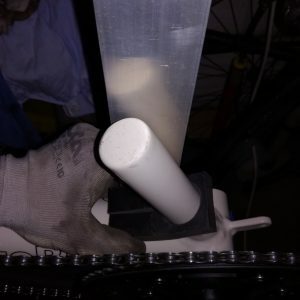 Given the weight and the size it is very important to add an extra security in order to fix it very strongly to the bike frame. width 5 cells (650 mm), normally is either 4 or 6 cells. I have chosen a shape for my new panels of 5 cells instead of 6 in order to reduce the width. 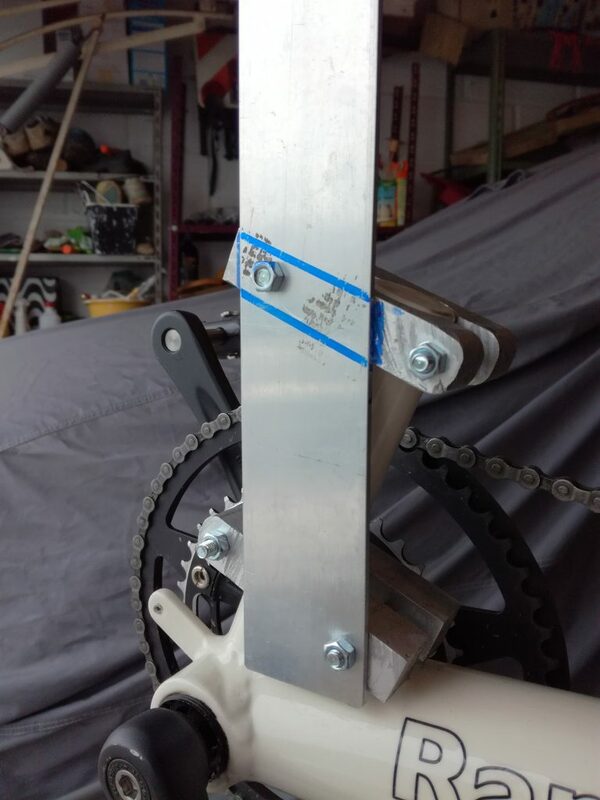 For the front support of the panels I have decided to use the beam which normally is used for the front derailleur. 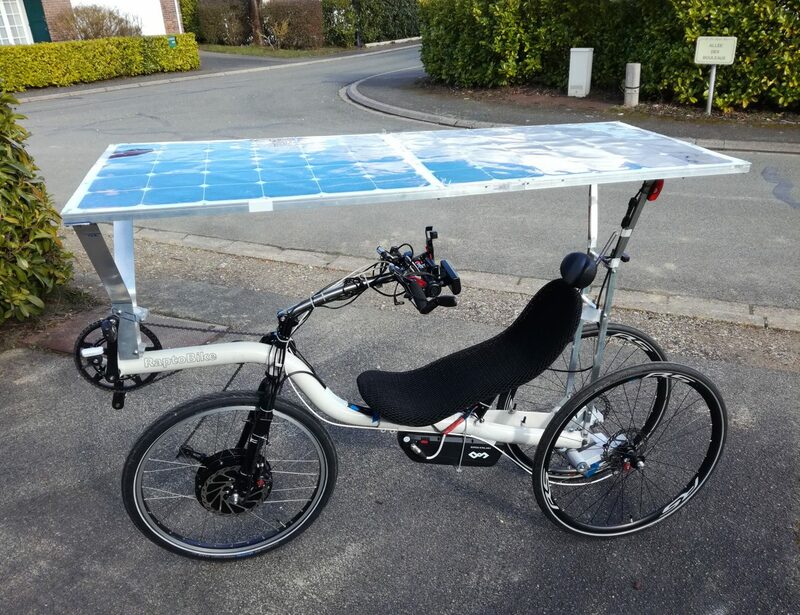 In fact in my Raptobike model there is no derailleur …so this is available to attach the supports for the solar panels. 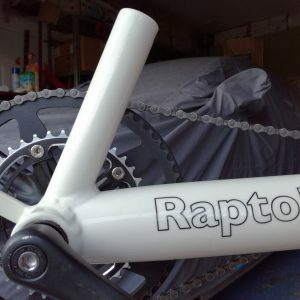 The idea is to build two supports in aluminium to be used as “clamps” to be tighten on the support for the front derailleur. Here it is a simulation in order to get the exact dimensions. 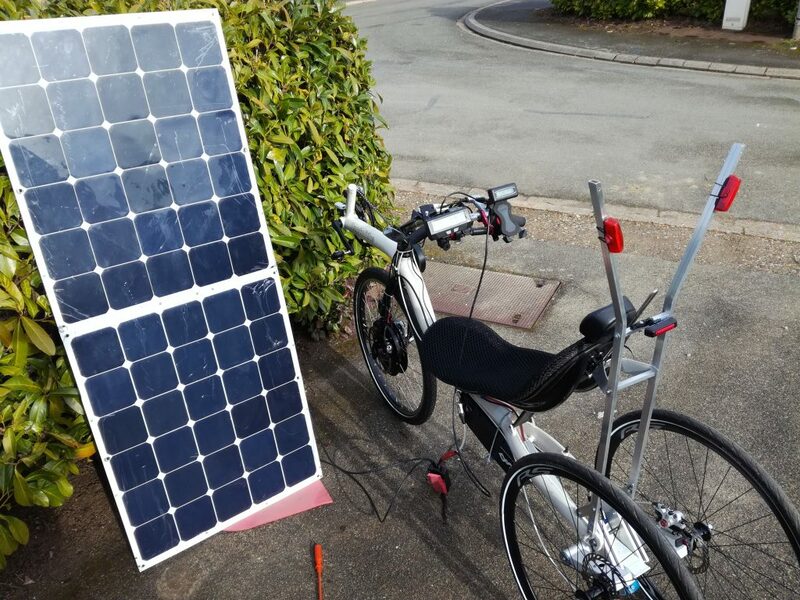 On my first Solar Bike project I had serious issues on the clamps to attach the panel support on the front. 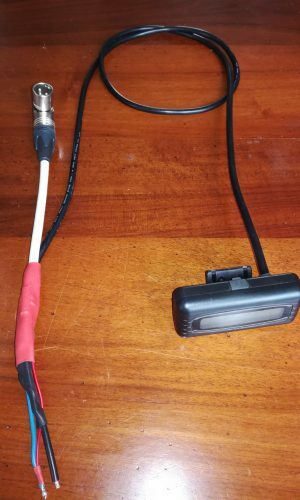 Here you can see the broken clamp: it happened to me twice, so for this new project I needed a much more robust solution. 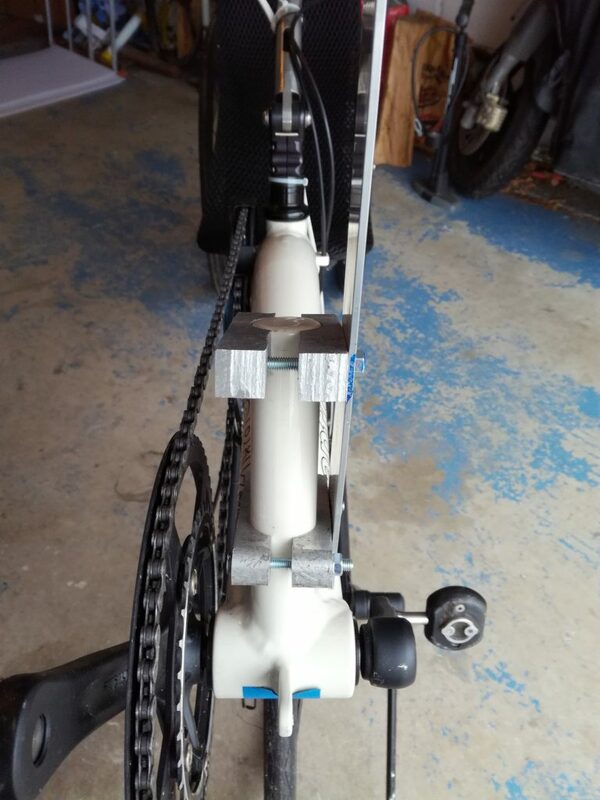 Here it is the way the clamps have been made (from a 25mm aluminium plate) and installed on the support for the front derailleur. 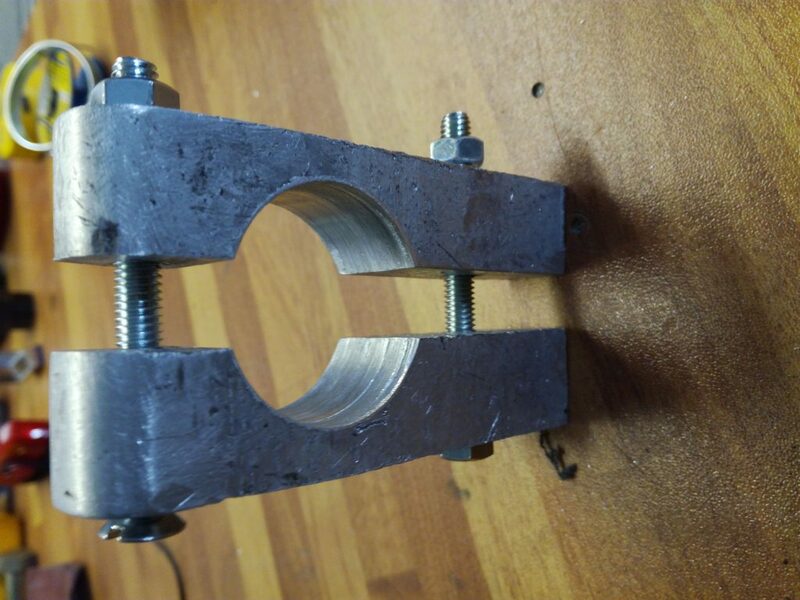 I was able to design and make the clamps with the help of Pierre, who is always really helpful and happy to give me support for this project! 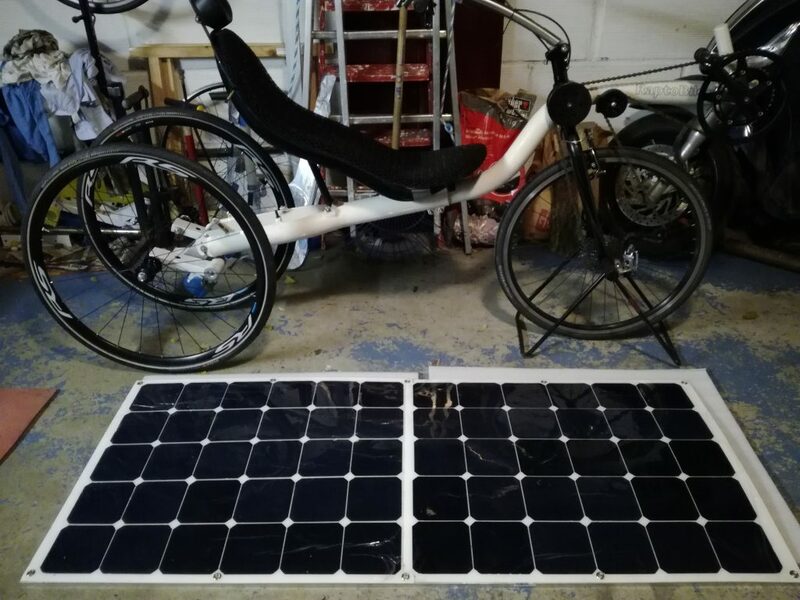 They look definitely really solid and hopefully they will last much longer than the ones I used on my first solar bike! 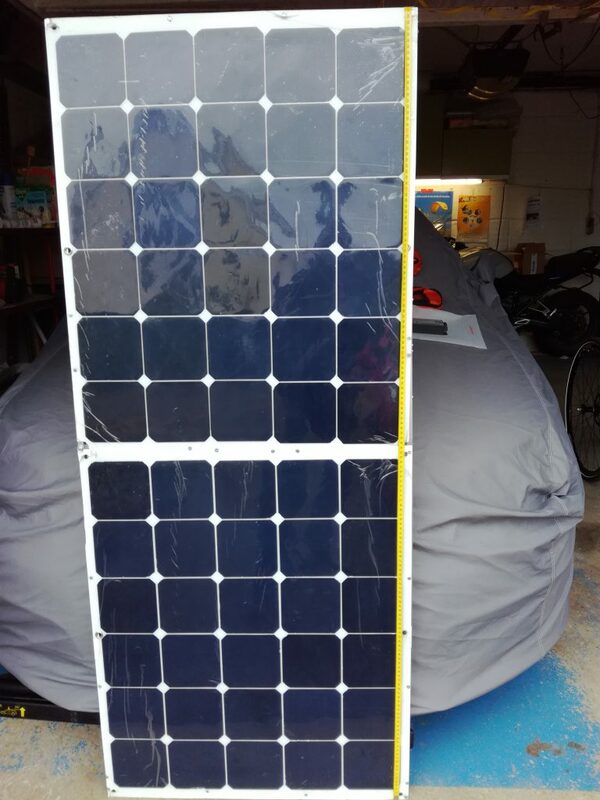 In the meantime I have been able to build the frame to mount the solar panels. 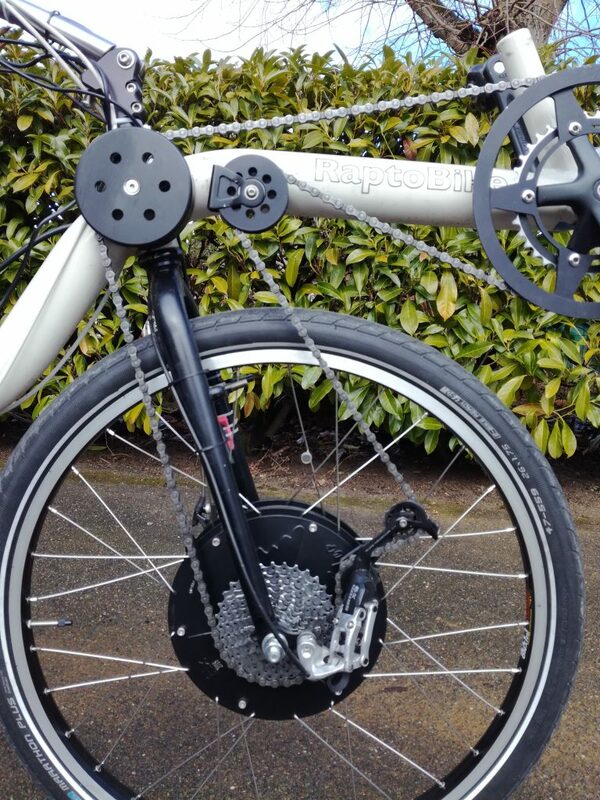 It is in aluminium, very light and rigid: I have used 4mm bolts to link all various pieces. 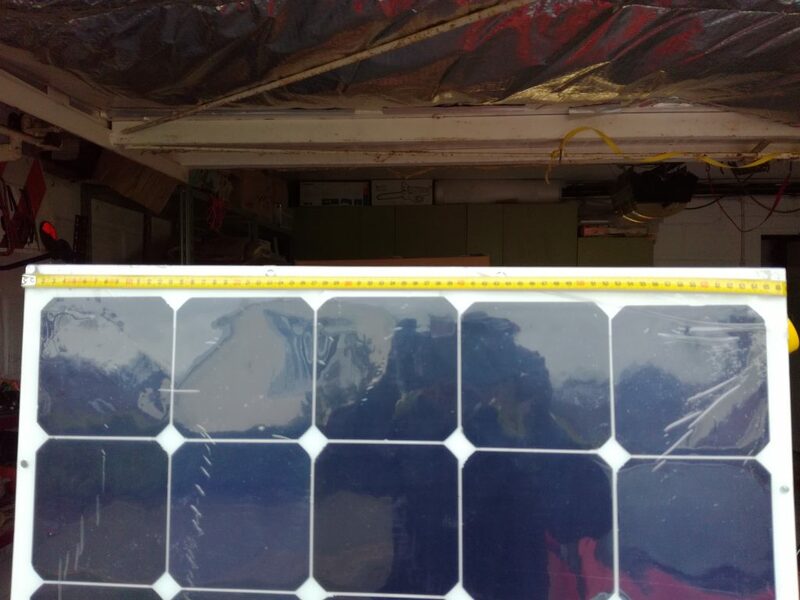 It is a very time (and patience…) consuming job, but from the quality of this activity it derives the life cycle and reliability of solar panels. In this picture I can easily hold the frame with one finger! 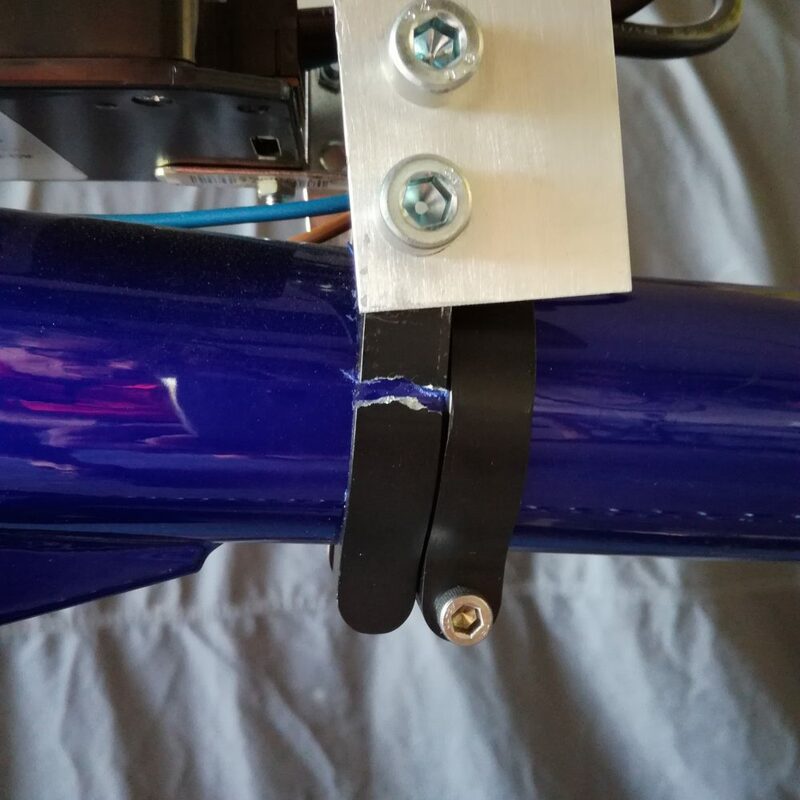 At this point I have started to install one of the flat aluminium supports: the challenge here was to find the EXACT angle to bend the support in order to obtain the desired height. 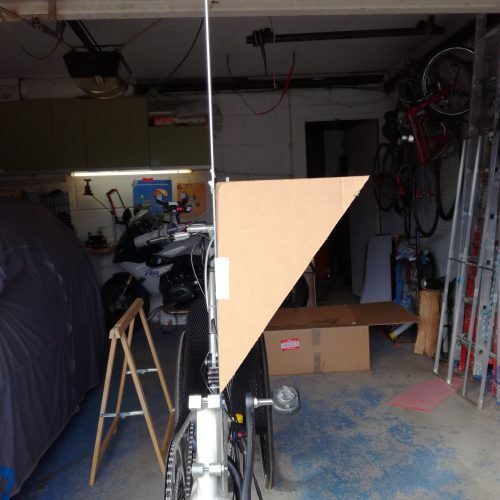 This is how I did it: I cut a carton triangle and I used it to bend the support with the exact angle required. 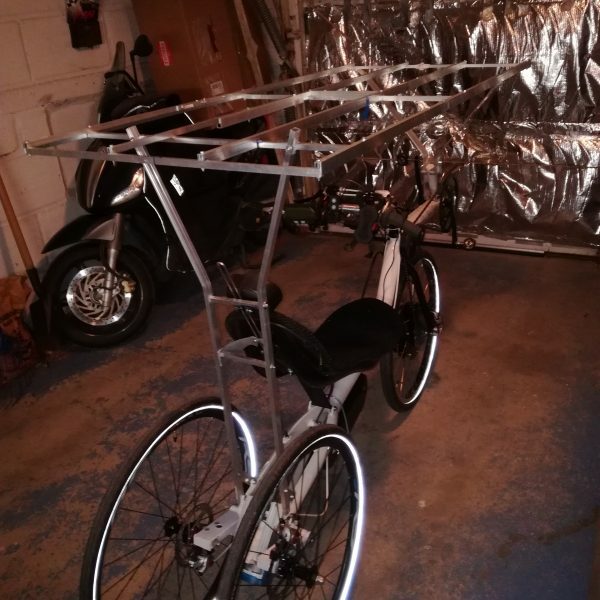 This is the end result with both aluminium “flat wings” that will support the frame for the solar panels on the front of the trike. 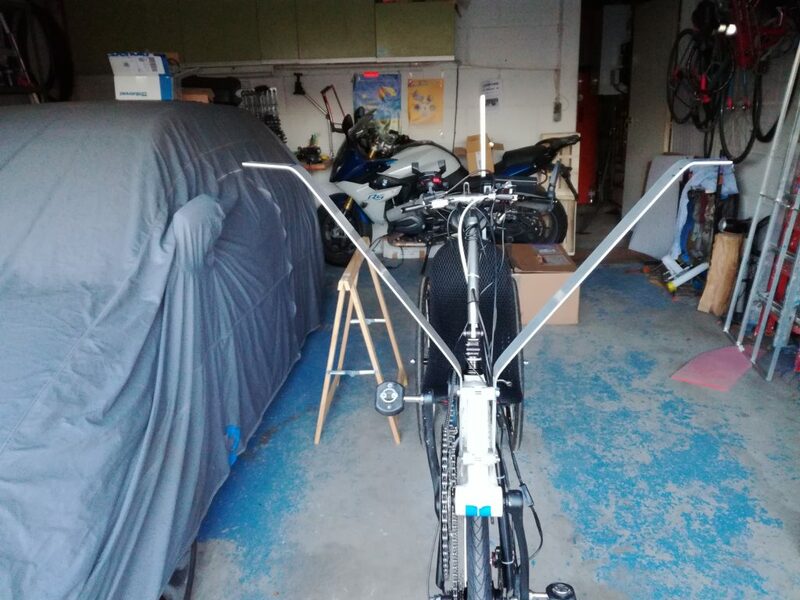 In parallel I designed the support on the back of the bike. 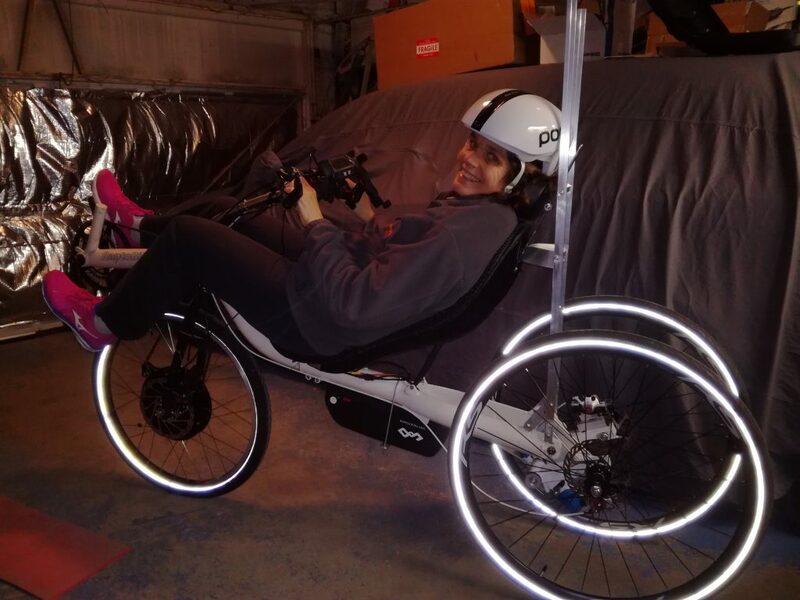 It took some ‘trial and error’ and also the support of my wife to check that the position was correct and there was no interference with my helmet. 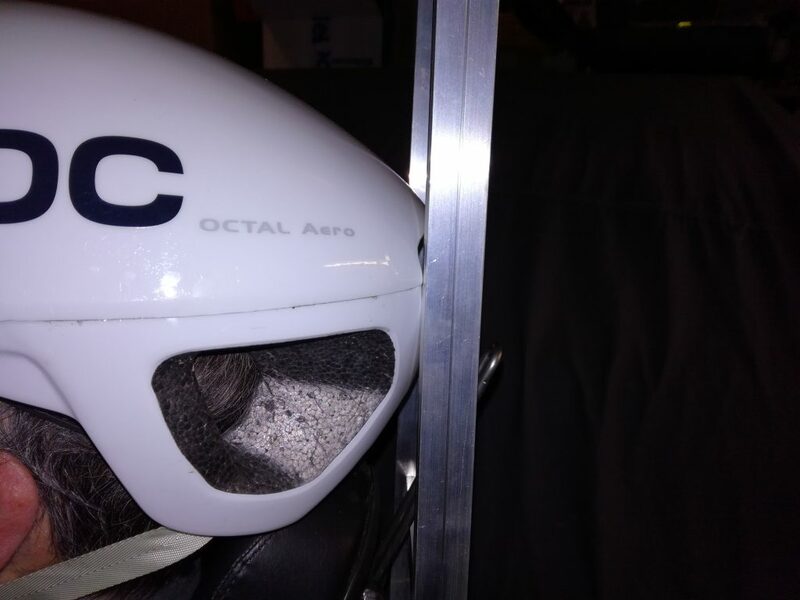 After above checking it was clear that there was contact between the helmet and the support structure behind my head. 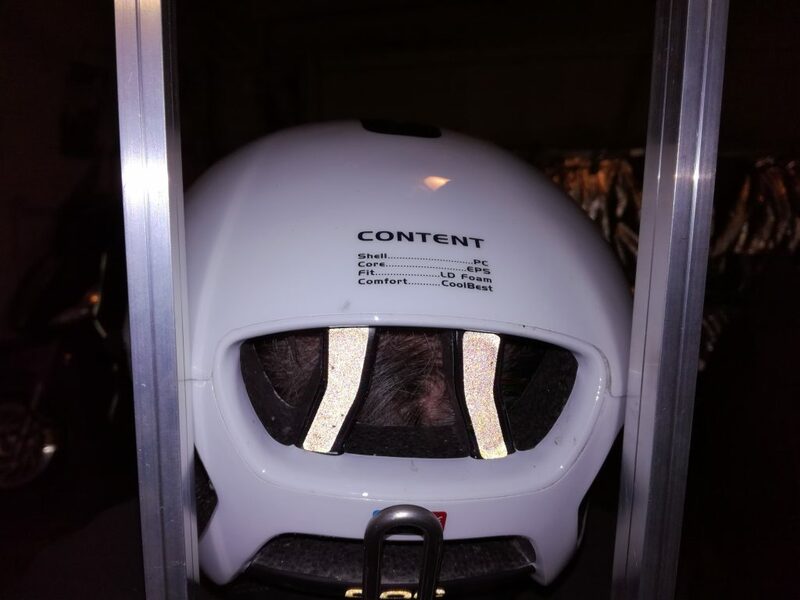 Here we can see that both supports are touching the helmet: for this test I have chosen the POC helmet whose aerodinamic shape is more evident than my other ‘non aero’ ones. There was no possibility to move further back the supports, since they are attached exactly where normally the rear brake calipers are positioned. So the only practical way was to slightly bend the supports giving them a ‘V’ shape to avoid direct contact. 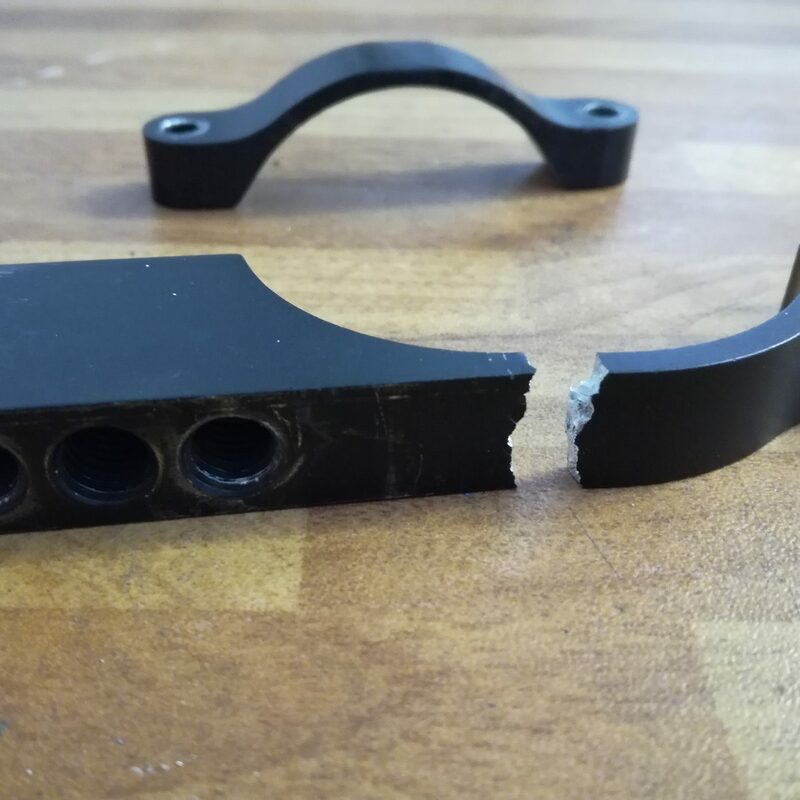 This is the end result: the process to bend the rear supports has been slightly harder than for the front supports. 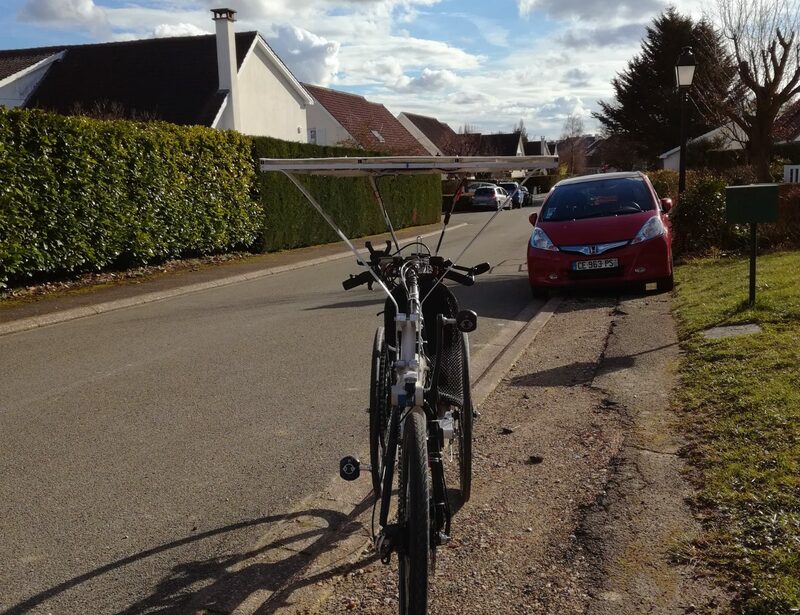 In fact here I have a square shape, so the bend has to be maximum 30° in order not to damage the aluminium support. 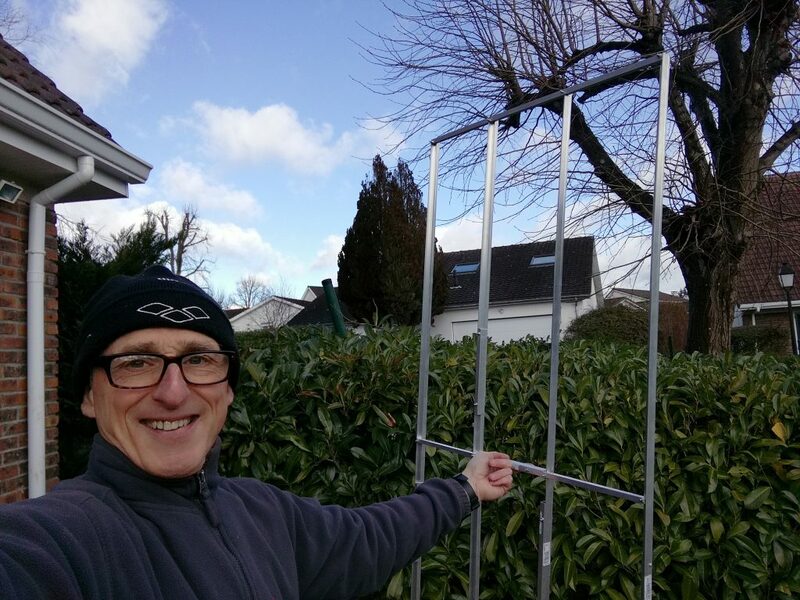 This is the end result of the complete aluminium structure to support the solar panels. 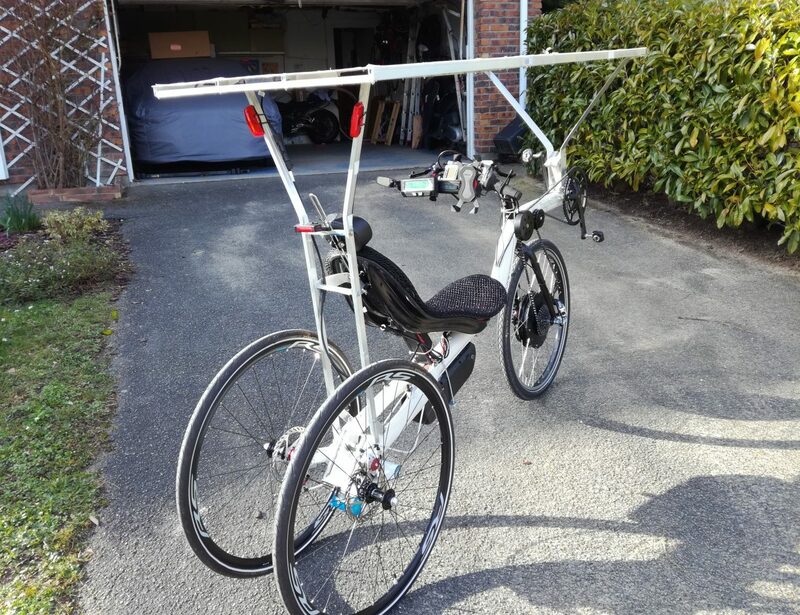 The flat top structure is connected to the front supports with 4 M4 bolts and with 2 M4 bolts in the back. 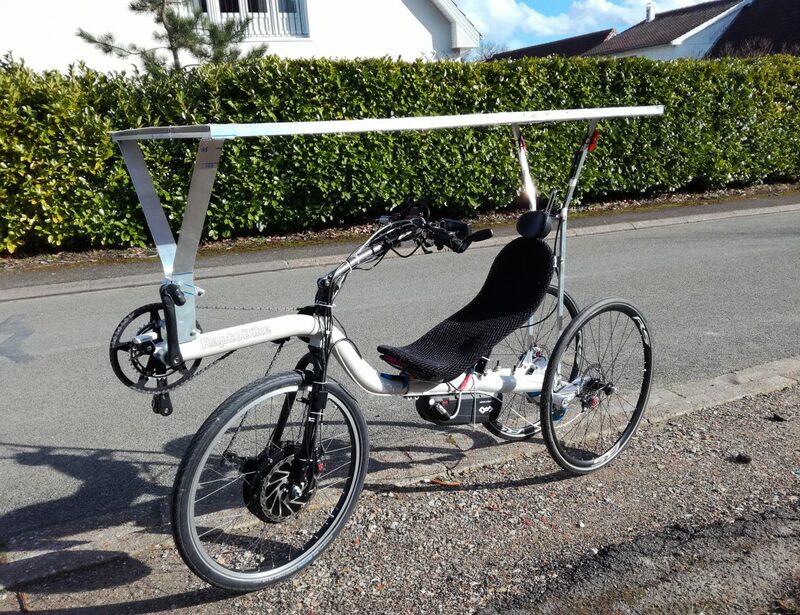 The weight of the frame including both solar panels is roughly 5kg. the plug to be inserted in the battery. 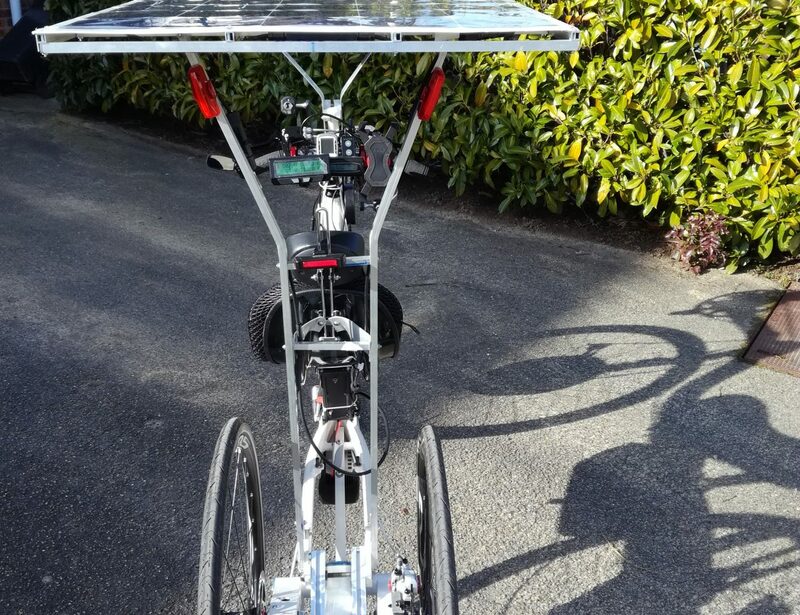 This is the final result, the Solar Tilting Trike V1!